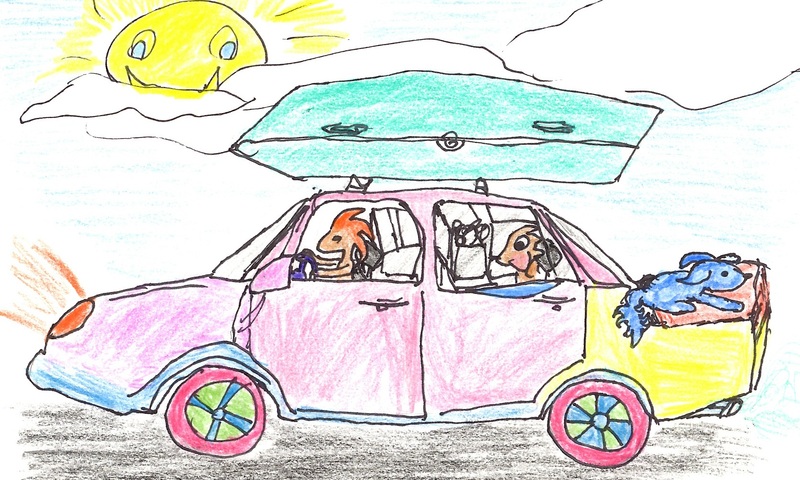 Nothing Like A Hot Summer And A Family Road Trip! Summer is always a great time for family road trips. Whether it is to go camping, see family or just a favourite destination, a family road trip is always an adventure. An adventure filled with conversations like” Are we there yet?” “I have to go pee.” “I am hungry.” “Can we stop now?” “How much longer till we get there?” and the dreaded “I feel sick mommy”, two seconds before they puke all down the front of themselves, their seats, the seat in front of them and the floor of the car. One time when I was little my dad who was driving the freeway and couldn’t pull over in time told me to stick my head out the window when I got carsick. You can imagine what the side of our white car looked like after I was finished. It took dad 20 minutes in the car wash to clean it off. Needless to say we carried an ice cream bucket and lid in the car from then on. • When traveling with babies leave right after the first feeding of the day. When Marie was a baby my husband and I used to leave right after the 4:30 AM feeding. Everything was dark for a while so she would sleep 4 to 5 hours with the motion of the car. Providing we kept the music on low, and didn’t stop. It was like a race to see how far we could get before the next feeding. • Fill the gas tank the night before and pack the car ready to go. Then in the morning you can just quickly throw in the kids and any last minute things and you are off before they have a chance to fully wake up. • Always pack activities for the kids to do! Bored kids become whinny kids! Each child should have their own back pack so they don’t have to share toys. We would always pack books for those that could read without getting motion sickness, games, small toys like Lego or magnets they could build with in their seats, toy cars or Barbies (you would be amazed how long they will play, before they know it you will be there) and as a last resort the Ipad or portable DVD player with a bunch of kid friendly shows. Even better is to purchase a new movie for them they haven’t seen before so they can watch it for the first time on the road. • Keep ‘em separated as much as possible and as far away from each other as you can in a confined vehicle. If you have two kids in the back seats put the pillows in the middle. The best Solution we had was a Mini Van where they could each have their own row of seats. The two that got along the best got to share the back row. • Always be prepared for motion sickness. The one time you are not prepared it will happen. We tried everything from giving my son ginger ale, acidophilus, or candied ginger to help settle his motion sickness. He usually did pretty good until we hit the twisty mountain roads then he would reach for his bucket. The only thing that worked was giving him Children’s Gravol. • Always, always pack a bucket with a lid on it and keep it close by. Ice cream buckets even a yogurt tub would do. One time we forgot and my son had to throw up in his pillow to prevent a big mess in the car. If you don’t need the bucket for someone being sick you can always use it as a garbage bucket later in the trip. • Bring along a package of baby wipes no matter how old your kids are. My kids are teenagers and we still pack the baby wipes on our car trips. They are handy for wiping dirty hands and cleaning up small messes. • Never rush a road trip with kids. Accept the fact that you will never be there on time and allow an extra couple of hours to get to your destination. Relax, take lots of breaks in areas where there is a playground so the kids can run and burn off some of their excess energy. I wonder if there is there such a thing as a perfect road trip? If you have experienced one I would love to hear about it. You could also share some of your worst road trip stories too. I bet there are some good tales out there. Please feel free to leave a comment and share yours. Remember wherever your destination this summer just relax and enjoy the ride. The whole family will arrive much happier and more peaceful than if you try and rush the trip. Drive safe everyone!